This article will provide you the troubleshooting steps if you have sound issues on BlueStacks. You will be able to fix the sound related issue. All users who are experiencing low/ no sound issue of BlueStacks. b) Click on 'Volume Control' and maximize it by clicking on '+' as many times, so it will grayed out as shown below. 2. a) Go to Windows task-bar, right-click on volume icon. 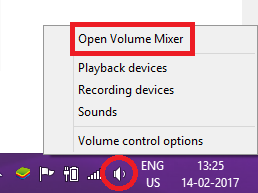 Click on 'Open Volume Mixer'. b) Make sure that the Speaker icon of 'BlueStacks Android Host' is not mute. Also, you may maximize the volume of 'BlueStacks Android Host'. 3 a) On home screen, click on 'System App' icon. b) Now click on 'Settings'. c) Now click on "Sound & notification". d) Now check the "Media volume". It should be maximum.